FILE - A Facebook employee walks past a sign at Facebook headquarters in Menlo Park, California in 2013. When you see a news story in your Facebook News Feed, you might assume that it is true. So, perhaps, you share it. But what if the story was false, or fake? Through a simple mistake, you might be spreading information that is untrue. 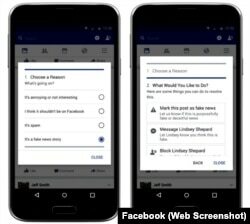 Facebook has started a program to battle the spread of fake news. 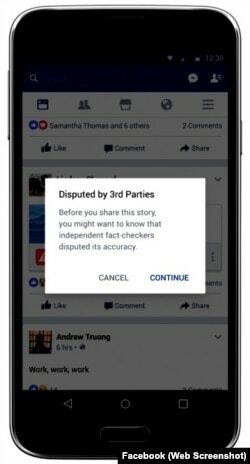 The program alerts Facebook users when independent fact checkers have disputed the truth of a news story. Facebook also has made it easier for its users to dispute a news story. The program for dealing with fake news has four parts. Each one is supposed to help users identify when a shared news report is not true. 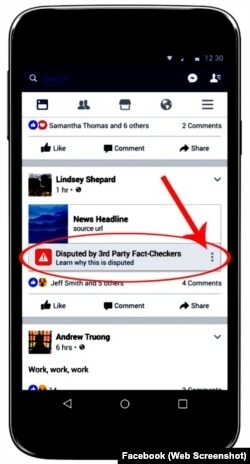 Facebook has started to work with independent fact-checking organizations to find out whether a disputed story is true or false. These groups have promised to verify news stories using the Poynter Organization International Fact Checking Network ethical guidelines. When these fact checkers dispute the truth of a story, Facebook will not block the story from News Feeds. Instead, the site will flag the story as under dispute. A link to an explanation about why a story is disputed will be included. Click on the three dots next to the story to find the link. Hover and click underneath the disputed story. Click 'About Disputed Stories,' or go directly to the independent fact-checking website." Facebook may also put disputed stories lower in News Feeds. You can share a story that has been flagged as disputed, but you will get a warning about it from Facebook. Facebook is making it easier for users to report a story as fake. Here are the site’s instructions on how to do that. You can also send a message to your friend who posted the false story, letting him or her know that the story has been disputed. Or, you can block that friend. The update includes software that Facebook uses to identify stories that may be in dispute. If many people read a story but few share it, Facebook may tag it for verification by the independent fact checkers. Sometimes spammers will spread false stories on Facebook to try to get readers to click on advertisements. After a story has been flagged as disputed by Facebook, that article can no longer be promoted in News Feeds or in Facebook ads. The process for marking a news story as disputed takes a while. Do not necessarily believe a story on Facebook is true just because it is not flagged as disputed. That flag may be coming. This update to Facebook is coming into use slowly, so you may not see flagged stories in your News Feed immediately. Have you seen stories on Facebook that have been flagged as being disputed? Have you reported news stories you have seen in your News Feed as being false? Do you agree with Facebook's way of identifying fake news stories?